NEW YORK, NY--(Marketwired - Oct 7, 2015) - As a cosmetic dentist in Manhattan, Dr. Marianna Farber has helped numerous patients achieve straighter smiles with the help of Invisalign®. While this innovative system can be beneficial for many people, she says that not everyone can achieve their desired outcome with Invisalign® -- some may require traditional wire braces if they have more complex orthodontic problems. At Contemporary & Esthetic Dentistry, Dr. Farber helps patients understand the benefits of Invisalign® versus traditional braces, helping them find the most effective solution for their individual concerns. The cosmetic dentist explains that the question of whether to get Invisalign® or traditional braces will depend on the extent of the patient's misalignment as well as their personal preference. Should they prove to be a good candidate for Invisalign®, Dr. Farber will have a series of customized aligner trays made, which the patient is instructed to wear at all times, aside from eating or drinking beverages other than water. Approximately every two weeks, she notes they will move on to the next stage of aligners in their series. Over the course of about a year or less, Dr. Farber says patients can see gradual improvement as their teeth slowly move into the desired place. While Invisalign® is an increasingly popular method for treating crooked teeth, Dr. Farber reveals the solution is not right for everyone. She says that patients with more complex needs are typically considered better candidates for traditional wire braces. This includes occlusion issues towards the back of the mouth, teeth that need to be rotated, and teeth that need to be moved vertically. Dr. Farber says the wire component utilized in this method can provide more strength and versatility in moving the teeth to the optimal position. Ultimately, patients desiring a straighter smile should meet with a qualified dentist or orthodontist to learn which solutions can help them reach their ideal outcome. While Invisalign® can provide beautiful results for many people, Dr. Farber says only a qualified dental professional can determine the most effective method for achieving a straight smile. At Contemporary & Esthetic Dentistry, Dr. Farber performs a variety of cosmetic and restorative dentistry solutions. 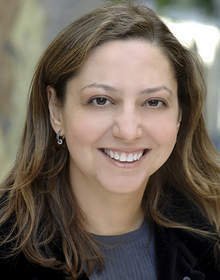 She earned her dental degree from the New York University College of Dentistry and went on to train in a residency at the St. Barnabas Hospital in the Bronx. Dr. Farber routinely completes continuing education in an effort to stay up-to-date with the latest advancements in dentistry. She is a member of several dental organizations, including the American Dental Association, the International Congress of Oral Implantologists, and the American Academy of Cosmetic Dentistry. Dr. Farber is available for interview upon request. To learn more about Dr. Farber and her practice, please visit mymidtowndentist.com.